The lead-up to Christmas day (shopping, stressing, cooking, planning, and so on) can easily leave us in a leftover-food fueled, sluggish comatose the days after Christmas. The problem is that Somewhere along the way we decided Christmas day was the end of the holiday, but it is the celebration of the birth, and the birth is the beginning! The Partridge in a pear tree represents Jesus, “the protector” or “partridge” in the tree of life that protects the ripening fruit. 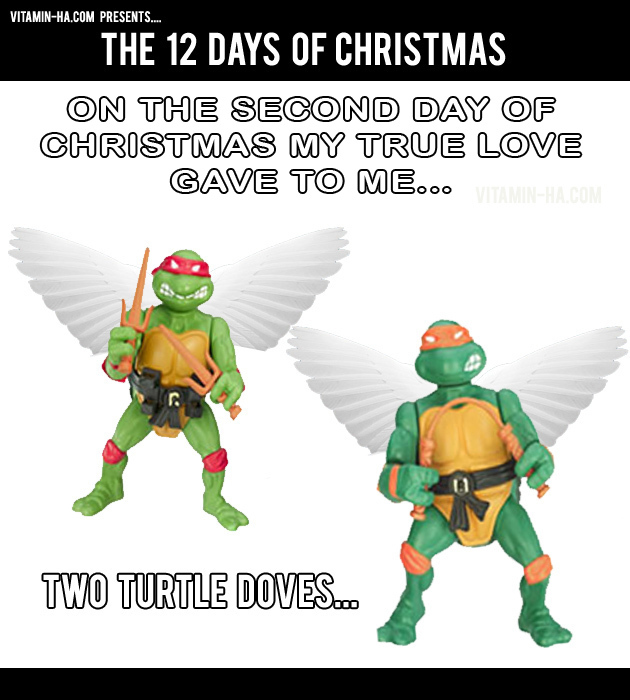 2 Turtle Doves: The 2 Testaments (Old and New) which together bear revelation to God’s story. 3 French hens: The 3 theological virtues of 1 Corinthians 13:13 (faith, hope, and love)… “and the greatest of these is Love” it reads. 5 gold rings: The Pentateuch (Genesis, Exodus, Leviticus, Numbers, Deuteronomy.) These first five books of the Bible are ascribed to Moses. 8 Maid’s a-milking: The beatitudes (Blessed are the poor in spirit, those who mourn, the meek, those who thirst for righteousness, the merciful, the pure in heart, the peacemakers, and the persecuted) These come out of the Gospel of Matthew’s Sermon on the Mount. 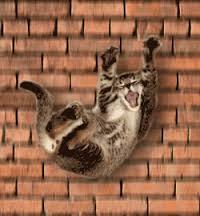 10 Lord’s Leaping: ten Commandments… can you name them all?? That all said, today is the 4th day (at least when this was preached, maybe not when you are reading it) and having no birds, lets take a look at the Gospel of Matthew (the 4 gospels being the alternative meaning,) Chapter 2, and some of what was going on after the Birth of Christ. Narrator: When King Herod heard this he was disturbed, and all Jerusalem with him. 4 When he had called together all the people’s chief priests and teachers of the law, he asked them where the Messiah was to be born. Narrator: After they had heard the king, they went on their way, and the star they had seen when it rose went ahead of them until it stopped over the place where the child was. 10 When they saw the star, they were overjoyed. 11 On coming to the house, they saw the child with his mother Mary, and they bowed down and worshiped him. Then they opened their treasures and presented him with gifts of gold, frankincense and myrrh. 12 And having been warned in a dream not to go back to Herod, they returned to their country by another route. Traveling through advent we studied a variety of texts from Ecclesiastes to Isaiah and into the gospels and each foreshadowed the birth of the Messiah in our world. Now predictions of prophets and angels are great, but as an “I’ll believe it when I see it” society, we like concrete things, we wanted the actual baby Jesus! So this past Thursday, we celebrated Mary’s giving birth to the Messiah in a manger. A manger? With all the buildup, the excitement and hype, that is a none-too magnificent entry, or so an observer would have thought. Jesus’ worldly beginnings were meager, but his true citizenship was in the heavens, and thus God gave birth to a star… now that’s impressive! You can name actually name a star after someone (or after yourself if we stray from that Christ-like humility!) Its only $14.95 plus shipping at Celestialregistry.com! (Shipping? do they ship you the star? I think not.) 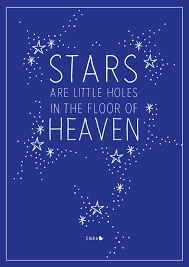 God didn’t get online and name a star, he put one in the sky for his son! I do want to highlight something from the scientific perspective that had me stirring in wonder a bit this week. A star takes millions of years to be created. It all starts when clouds of gas and dust from other atmospheric cataclysmic phenomena come together via a little thing called gravity. This pressured clump then starts rotating as a disk, and as it accelerates, the core (or protostar) of the swirling disk gets hot. When the “protostar” heats enough, hydrogen atoms start to fuse together with helium, which exponentially increases the energy present, until finally, BAM! It erupts, blasting away all the dust and gas and a fiery star is born! Now that little rabbit hole of a science lecture could do one of two things: it could take ALL the magic out of the story in Matthew; the mystical appearance of a star to guide the wise men to the newborn baby Jesus far off in the town of Bethlehem. Or- it could excite the heck out of you! Think about it! When the world seems out of control, when we get anxious about what tomorrow holds, when we don’t feel as though we have any direction or that we lack purpose and support in this world, how amazing it is to think that God knows us so well, is so powerful, is so present and has things under such control that he initiated the birth of a star millions of years ago that brightens up our sky at the perfect second to guide us home. How exciting and comforting to know that, when times seem dark, God is not only present, but has a plan and will light our way. After all, stars shine brightest in the night sky. But he still couldn’t find Christ himself, so he called the Magi, the wise men, and sent them on his behalf. 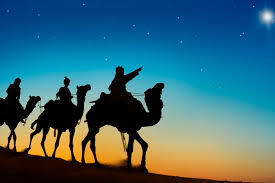 Who were these “wise men” or Magi? You have Melchior; a Persian scholar, Caspar; an Indian scholar, and Balthazar; an Arabian Scholar all traveling together in their search for Christ. Take notice of the amazing diversity! “Magi” is synonymous with the words astrologer and magician (basically one in the same in ancient eastern culture), but could be most accurately understood via the Persian position of Priest or philosopher in this instance. Priest or philosopher… why not magician, that sounds cool?? Why not scientist, that sounds concrete? Why not king Herod, he has power? Simple… because you do not need political stature, magic, nor scientific wisdom to seek and find Christ. Why not? Because Christ was never, or IS NEVER hidden, at least not to the faithful. In this story Herod’s intentions were untrue and shaded the path to Christ, to truth. If I can teach you all one thing, it is this: the whole Christianity thing really isn’t difficult. We, as a society, just like to make it complicated sometimes. But Jesus doesn’t hide unless we hide him. Throughout the year we can get lost in theological study, discrepancies in biblical interpretation, or contradictions between denominational beliefs, but faith isn’t that complicated, its as easy as a manger and a star. Christmas time is magical because allows us to retreat back the simple faith, trust, and excitement of our childhood. A child may have asked how Santa fit down the Chimney last Weds night, but when the presents were waiting Thursday morning the logistics of the chimney trip didn’t much matter! Open our eyes to simplicity and the stars will appear to guide us… don’t worry about how they got there… the million-year, swirling, hydrogen-fueled, gravity-induced explosive creation. Don’t worry about what this would do to a 5000-year creation time-line or the discrepancies between science, faith, and logic that come with it. 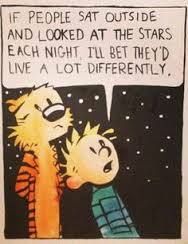 Just look up! Keep the simple bliss alive! That said, it is important to know that God not only created the stars with artful intentionality and purpose, God created you. You too are a guide for those you meet, pointing to the Heavens. You are a star! So I leave you with this: I don’t like cats… If that statement didn’t leave you wondering, than you probably were daydreaming (had your head in the clouds… or stars) so let me explain. Actually, I like them fine, the problem is that they do not like me. My ex-girlfriend, Julie, had a particularly evil feline, and one day, when Julie was mid-way through the two-hour endeavor she called “getting ready,” I found a toy laser pointer on the desk. The cat loved it and chased it frantically across the floor! I made a circle motion and watched the furball frolic after its own tail (and cats are supposed to be the smarter pets,) until boredom kicked in, or should I say mischievousness. The cat tore through the living room, ramped off the couch, and landed himself at the top of the blinds, which as predicted, did not hold the beast, who proceeded to fly out the screen-less opening and knock down a windowsill worth of décor, all right as Julie was walking out. “What was that!” Julie asked? You are a guide as well as a traveler. You are a Magi, and you have been given the necessary stars to follow. When the world gets crazy and change takes hold, keep your gaze on the heavens, and return to the simple path that God has lain before you. Trust it. Trust yourself. Beware of the false lights though, the laser pointers of our world that skew our direction. Just the same, don’t be a false light to others, be who you are, for God created you, a star, for a reason! Thought of the day: What is one false light (a laser pointer distraction) and one true light (a star or hole to heaven) present in your life?